There was already a long queue right outside the closed shutter, patiently waiting for the shop to be opened at 6.00 pm. 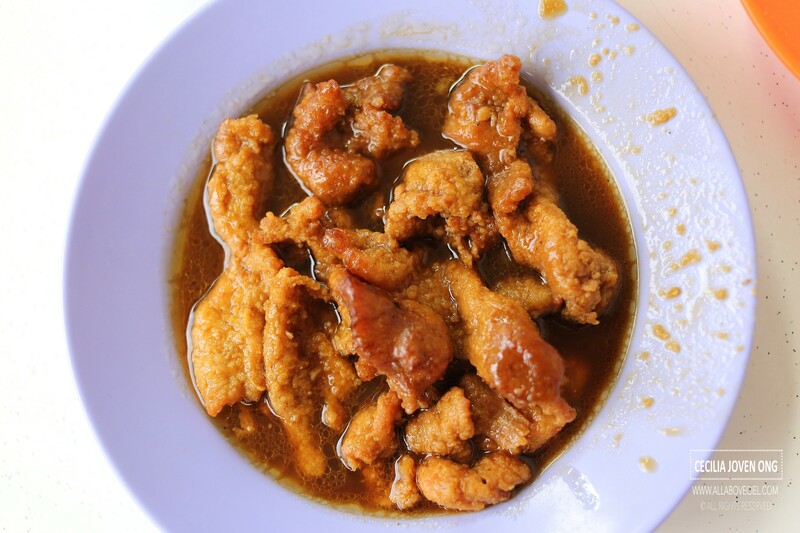 I know there is a famous Hainanese Curry Rice stall in this coffee shop but i have never get to try it. I decided to join in the queue as i was told to come back later by that curly hair Auntie selling satay at the corner coffee shop. She could not quite cope with the massive amount of orders at that time when i wanted to order earlier. When the roller shutter raised, the assistants started to arrange tables and chairs along the pathway. Some of those in the queue moved away leaving their friend or family member to be in the queue to do the ordering later and they went to sit at one of those tables. 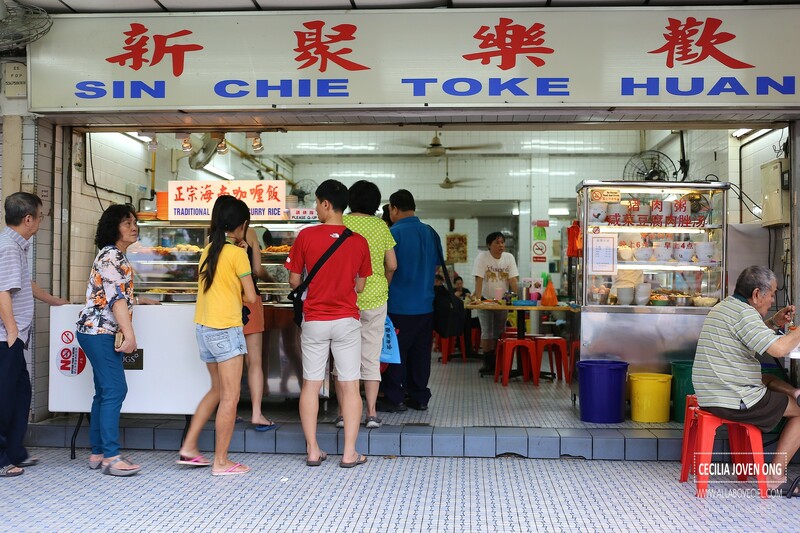 As this was my first visit, i decided to order some of those dishes more commonly selected by their regular customers. After ordering, i was expected to pay then they handed over the 2 plates of rice to me to carry it together with an assistant that got the rest of the dishes on a tray and followed me to my table. First dish was sliced pork cooked in soya sauce and sesame oil with bits of shredded ginger, a homely dish that done well. It was nicely flavored and went rather well with the plain rice. I could finish my plate of rice just with this particular dish. 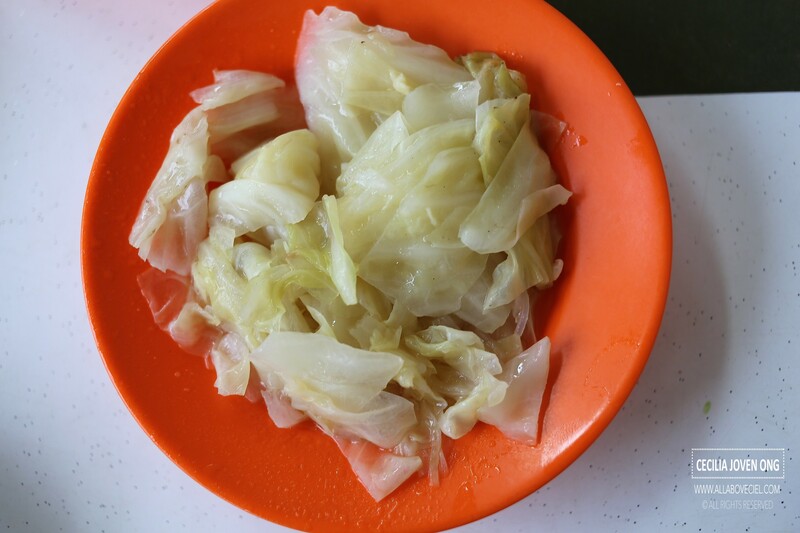 Braised cabbage has always been my favourite and my usual order whenever having Hainanese Curry Rice. It might not looked too appetising given its color but the texture was of the desired softness and it actually tasted alright with a hint of natural sweetness detected. 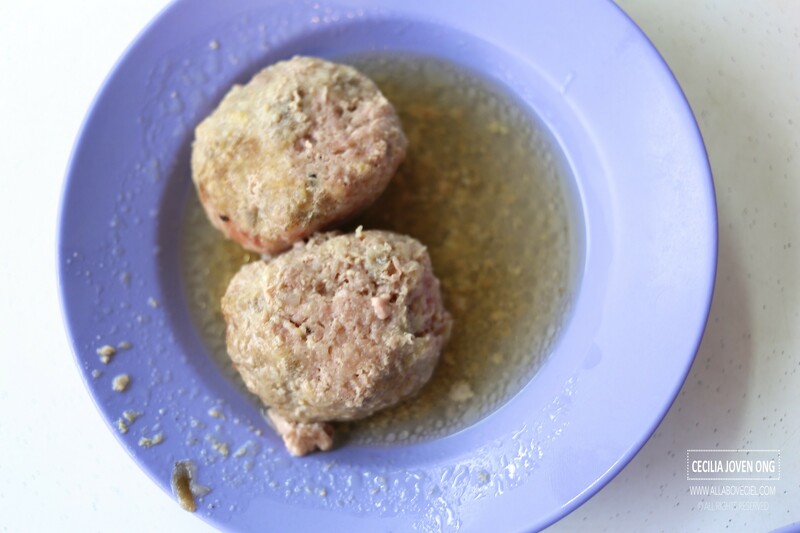 The steamed meatballs did not taste too memorable though, it was just pleasant tasting. 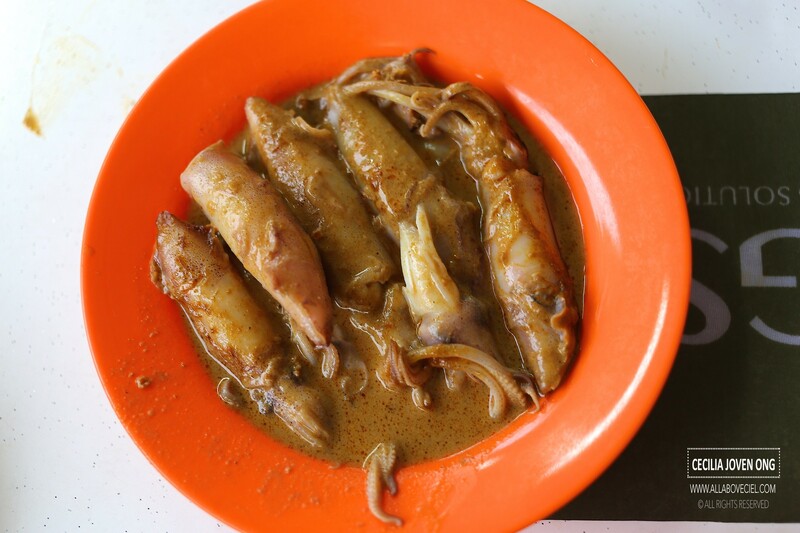 My favourite dish has to be these squids cooked in curry sauce. This dish reminded me of a similar dish that my dearest Grandpa used to cook. The texture of these squids was of the desired softness with a slight chewiness. 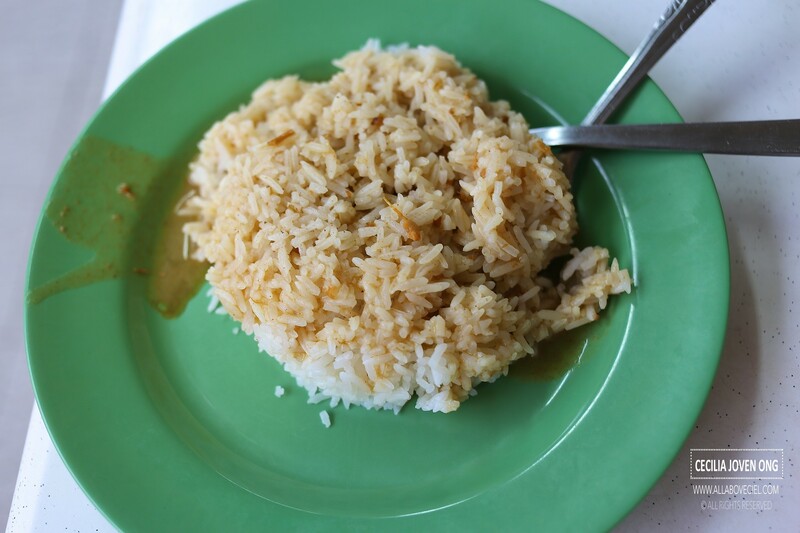 It was tasty when had it with the curry sauce together with rice. I would likely to order this again. All the dishes went rather well with the rice. This was a simple yet homely dinner that i really enjoyed. I could not quite remember the exact price that i paid but if i remember correctly, it should be less than $12 for all. There was still a long queue when i left. I was told that the pork porridge stall in this coffee shop is pretty good as well. Maybe i should just order a bowl of pork porridge to go with some of those dishes when i am there again.